On the first Saturday in May since the year 1883, the “Run for the Roses” has championed horse racing at the famed Kentucky Derby in fair Louisville. Events begin two week earlier with “Thunder Over Louisville”, the largest fireworks display in the world. The Great Balloon Festival, the Great Steamboat Race and the Pegasus Parade all follow, leading up to the fabulous Derby Day. Yet despite all these activities set to the restless sound of the waiting horses, it is the culinary traditions of racing’s royalty that many remember and enjoy year after year. Most famous, of course, is the mint julep, a nearly magical drink with an often misplaced history. 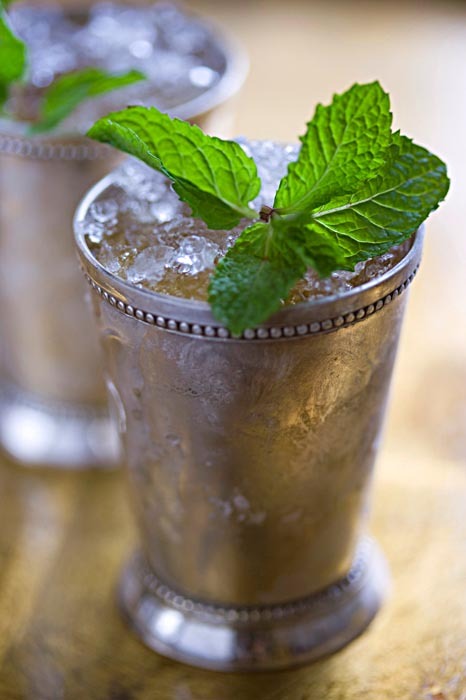 The mint julep is a classic American cocktail, long beloved in the South. Yet few know its national fame began, not south in Dixie, but further north in Washington DC at the Round Robin Bar in the Willard Hotel. Prior to the beginning of the Civil War in 1861, many senators worked tirelessly but unsuccessfully to resolve the issues of taxation, representation and black emancipation that were threatening to tear the nation apart. One of the hardest working senators was the esteemed Kentucky son, Henry Clay. An experienced hand at matters diplomatic, he often gathered those in conflict over state sovereignty and the issue of slavery together at the Willard Hotel and ordered that his favorite southern drink, the mint julep, be served. For you see, the Willard’s Bar was actually round so no one and no point of view could hold center court. No individual could dominate from a head table there. He hope that, with a relaxing mint julep in their hand, cooler heads would prevail. Sadly his efforts to reach a resolution failed and a great national war occurred. Yet many remembered his valiant efforts and when horses, northern or southern, later raced at Churchill Downs in the Kentucky Derby after the Civil War, well, when combined with local traditions, the mint julep seemed (and still is) the perfect drink for the nervous horse owners and the waiting racing fans. So enjoy this liquid classic and don't forget to pick your winner before the buzzer sounds! Posted on May 3, 2011 by Ana Kinkaid and filed under Alcohol, Civil War, Cocktails, Culinary History, Elegance, Spirits, Style, whisky and tagged Churchill Downs Henry Clay Kentucky Derby Mint Julep Round Robin Bar Washington DC Willard Hotel.